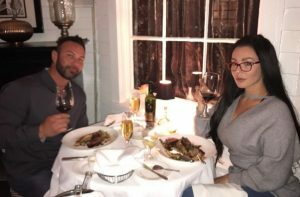 JWoww shocked everyone when she posted a lengthy statement on her website which included a video of Roger throwing her to the ground. TMZ broke down all of her claims of abuse against Roger. It just sounds horrific. In her statement, the reality star alleges longstanding abuse over the duration of her marriage. In the video JWoww shared, Roger grabs her and throws her to the ground. TMZ said it sounds like he says, “You wanna get violent?” Clearly, a very volatile situation is unfolding in the series of clips she shared. You can hear the couple’s children yelling in the background, which makes the situation even scarier. The explosive drama does not just involve JWoww and Roger. Longtime fans of Jersey Shore might remember JWoww’s ex-boyfriend Tom Lippolis. They dated during the first three seasons. The pair broke up and she claimed he was possessive and abusive. JWoww’s relationship with Tom also escalated to a physical level. JWoww revealed years ago that Tom once tossed her down a flight of stairs before filming the third season of Jersey Shore. Police recently arrested Tom stemming from an attempt to blackmail her. If that isn’t crazy enough, she alleges that Roger was behind the extortion plot! JWoww furthers the allegations against Roger by discussing his misleading image in the public eye as a parent. In her statement, she says that Roger is often neglectful of their children’s needs and medical conditions. The couple’s son Greyson was recently diagnosed with Autism and requires extra attention and care. TELL US – WHAT DO YOU THINK ABOUT HER STATEMENT? ARE YOU SURPRISED THINGS GOT PHYSICAL BETWEEN THEM? HOW DO YOU THINK THE SITUATION WILL PLAY OUT?